Bachelor Blake Garvey has spoken to Woman’s Day magazine about his decision to end his relationship with winner Sam Frost. But his comments will raise questions about the edit of the finale that was presented to viewers. “Being back in reality, in a long-distance relationship, having unfiltered contact and really getting to know each other more,” he said. “It highlighted that Sam is someone I absolutely love and care for but not in the way of a romantic partner. I realised there was a change over the six weeks – the chemistry changed. 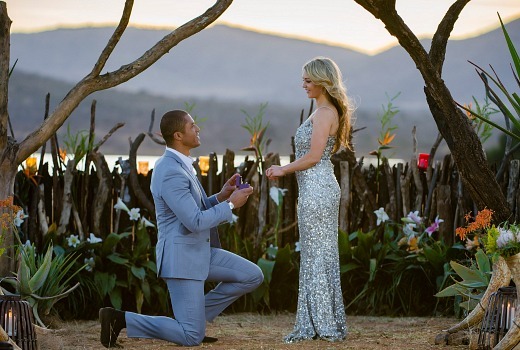 Viewers who watched a proposal air on Thursday night’s finale will curious about when the relationship ended. It raises questions about whether the finale should have edited out the proposal and simply left it with his choice of winner, which would have been a fairer account of events. Sam Frost told the magazine, “I burst into tears to be honest. I’m so numb at the moment. Just trying to process it all. While the show has attracted plenty of interest, the fallout could also raise concerns about whether the audience is ready to buy into the brand again in 2015. Both Blake and Sam will speak to The Project tonight. When similar things have happened on the US series, hasn’t the jilted/mistreated/heratbroken woman gone on to be The Bachelorette ? I think it is fair enough that the proposal was shown, it did happen even though they broke up soon after. And it wasn’t like they put a blurb after the proposal saying they are still happily together. I don’t know, maybe I’m too cynical but no one really believes that this is the way to go about romance do they?! I mean it’s very hit and miss, the couple from last year are still together but most of the US couples have broken up. It was very quick though for Blake and Sam! I never believed that he was there to find someone anyway, he just wants fame (but now he has notoriety!) I thought people mainly watched it as a bit of fluff, if not it seems a bit naive. Everyone should watch Burning Love which is a parody of The Bach series in the US, hilarious! Idea for ABC and Reality Check….do an xmas special with the focus on this years Bach….a full dissection including Oshers hair!! Ha! And I bet TEN are counting their lucky stars. I wish Reality Check went for one more week. I bet they do too! Ahh who was it that said long distance relationships dont work !